Well , today’s beauty topic is Sleeping Beauty ! Woken up by my Prince charming’s kisses every morning but this Sleeping beauty falls back to sleep after that lol. Too tired lah..every work till 2am. So i went out on Sunday afternoon for lunch with my bf and his baseball team mates. Those who came for lunch were from Gyeongsan-do ( cities like Busan , Daegu , Gochang etc etc which is near the coastal area ). They speak in Gyeongsan-do dialect since they were from the same area. Only my bf and another Oppa speak with very heavy Gyeongsan-do saturi accent. That’s why I have to open my ears real wide and focus when they tried to speak in Seoul dialect to me which was what i learnt in school and my classes. It was a good practice for me because now i can understand abit of the gyeongsan-do dialect ( maybe 40% ? ). One of their wives had mul-guang 물광 injections done. She looks really pretty and young. What is mul-guang ? It means dewy look in Korean. 물광 주사 (Mul-guang ju-sa – Mul-guang injection ) is a kind of injection where the doctor injects hydrating skin boosters into your skin to create a dewy glow. The boosters locks in the moisture which creates the natural glow. I have not done it before and not sure how long it will last. If you are afraid of injections and yet want dewy skin. Then you have to be very discipline and keep your skin always hydrated with good products. Copy this 4 korean words into google search ” 물광 주사” and look at the images if you want to know more. Or these 6 Korean words “물광 주사 가격”into google search to see before and after pictures. The weather was soo hot and im feeling very lazy. Oppa asked me not to put on any make up. He doesn’t like ladies with thick make up or overly done eye shadows and prefer natural looks. Good thing is that i always go for natural look make up so he seldom nag at me. So i went out without make up and only apply sunscreen gel and tinted lip balm ( see picture below ) . Sun screen is a MUST ! Even though i don’t put make up but i will not skip my sunscreen gel. It is a water base and i love it alot. No grease and feels like applying serum on my skin. Got it from Missha for only KRW 2,500 during sales. Heh heh..i don’t go out without make up just like that ok. Before going out without any make up , i will do an extra step of skin care and that is MASKING ! So let’s talk about masking. 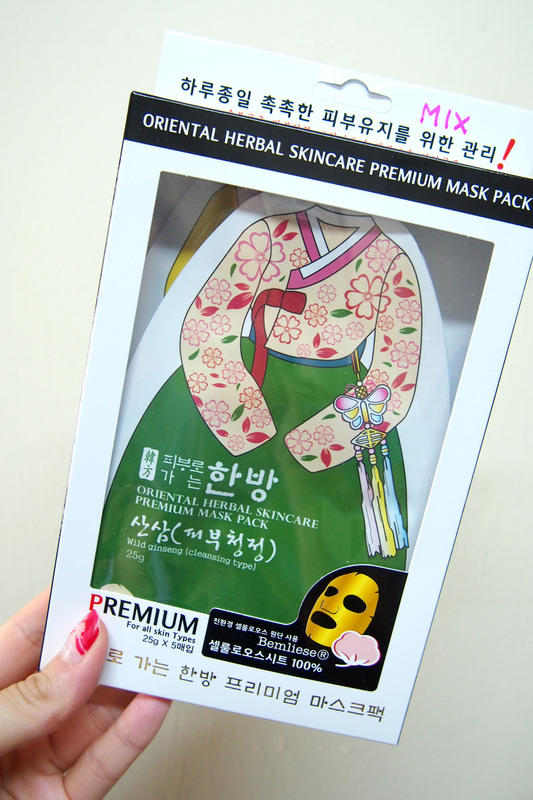 There are many kinds of masks and packs in the market now. There is the modeling pack. Where you scoop up the powder and put it in a bowl , add water , stir and mix , apply onto your face with a brush , wait for it to harden for about 20 minutes and peel it off. 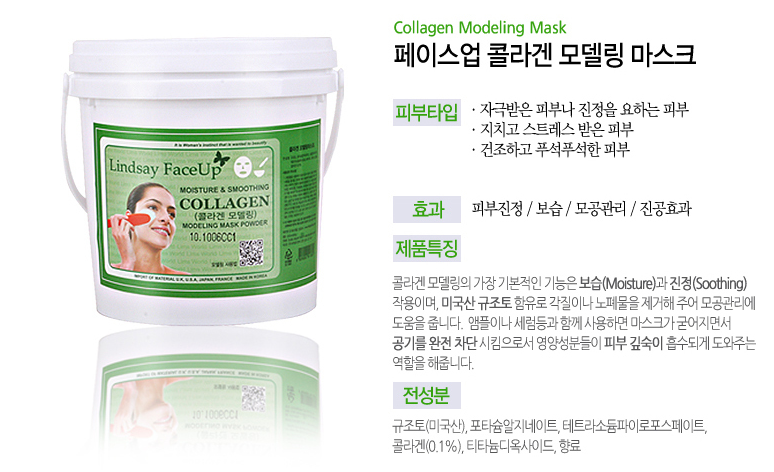 I bought a bottle of Collagen Modeling Mask but i have not used it yet. Too lazy and find it cumbersome. And then you have the sleeping packs. 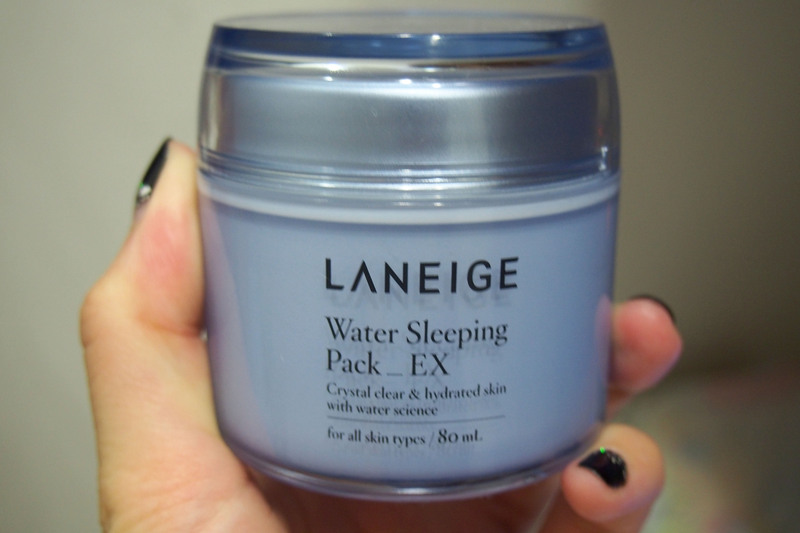 Im currently using Laneige Water Sleeping Pack and Sulwhasoo Vitalizing Overnight Pack. The former is more for hydration and latter is for brightening. Also there is the night cream. 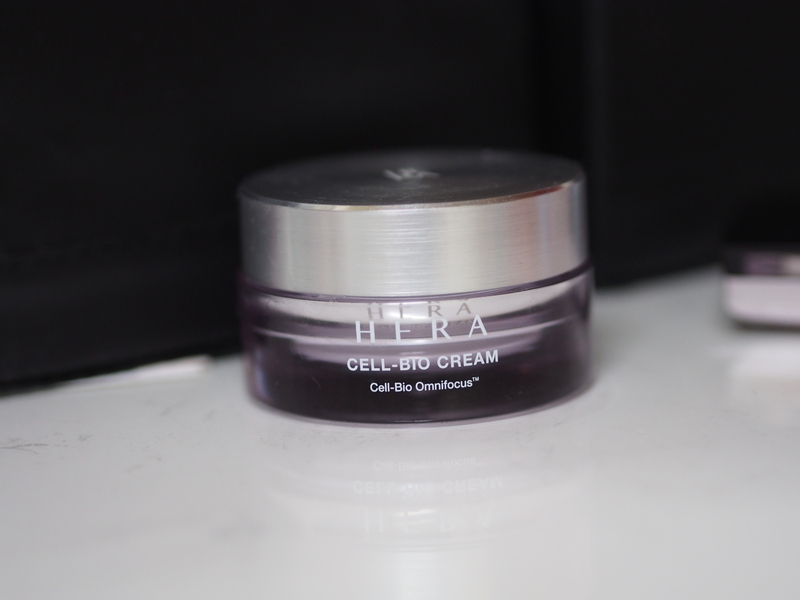 Im currently using Hera’s Cell-Bio Cream. It is more of a night cream to me because it is quite thick. I will apply and sleep overnight with it. And then you have the sheet masks. Im currently using Missha’s green tea and pearl mask , Hera’s white program masks , Cell-Derma T-laser Hydrogel masks and the new Korean Oriental Herb masks from Aeon Aesthetics and Medical Clinic. Just got them on CNY Eve. So cute the packaging. Comes in 5 different sheets for different skin conditions. They are made of Korean Oriental herbs. Directions available in Korean and English. Available for purchase in pack of 5 only. 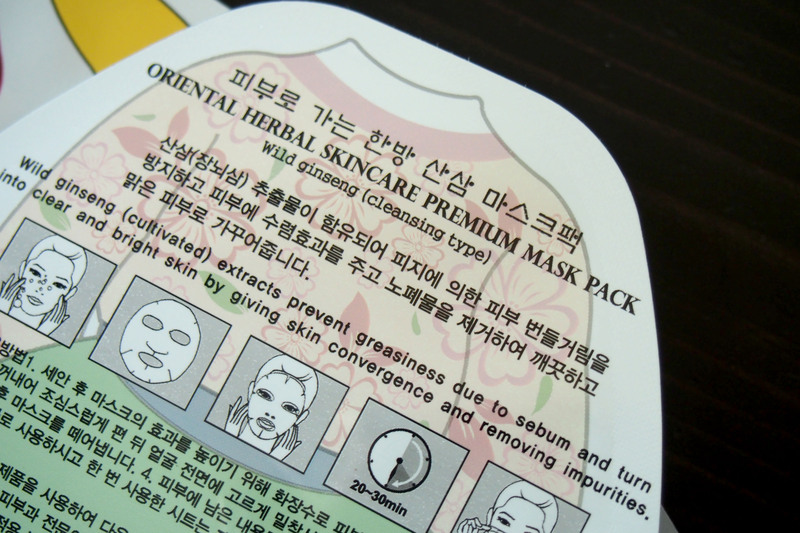 Comparing Hydro-gel and Sheet masks , i prefer the sheet masks because they are soaked wet with the essences in the packaging. Whereas for Hydrogel masks , they dry up pretty fast if you don’t store and keep them properly. But of cos the fit for hydro-gel masks is better because they really stick onto your skin and face shape as compared to sheet masks. But Sulwhasoo hydrogel masks are the best because the gel masks are thin and really soaked wet with serum and essences ( but they are too expensive) . I don’t recommend sleeping over night with the modeling pack and sheet masks on your face. It somehow made your skin feels dry the next morning. Well , i go to sleep with the packs or cell-bio night cream. I mask my face everyday lol. Yes..i have to if not i feel very…hmmm strange and “empty” like as if i missed out something. I even mask my face on the plane. Besides applying on my face , i also apply on my neck and shoulders. But how to apply on your neck or shoulders when you are using the gel or sheet masks ??? well , there are always left over essences or serums in the packaging after you took it out. I will put on my hand in and feel around and then spread the essences and serums on my neck and shoulders and face. If i applied sleeping pack or cream overnight , i will use a damp warm towel to slowly clean it off the next morning or do a mild cleansing with very little cleansing foam. When you apply these overnight masks or creams , make sure you have enough sleep and have a good rest. On days when i go out without make up , i will put on sheet masks first. After shower , i put on the sheet mask and then my normal skin care routine ( toner , essences , serums , emulsions and moisturizer ). The mask helps to brighten up my skin and so even though i went out without make up , my skin tone still looks even and nice. I will also put on lip balms. I dont want my face to look moisturized but yet my lips looks dry and chapped. Sheet/gel masks aren’t only for night use. You can use it in the day also ! 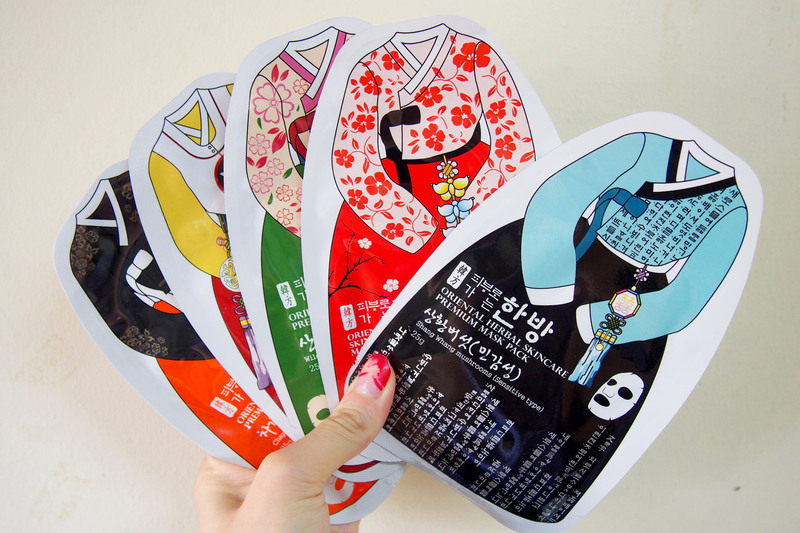 If i have any important appointments , dinners or occasion , i will put on sheet masks before applying my make up. After swimming or under the sun for too long , i will put on aloe vera gel masks and then another layer of whitening mask. I don’t just apply the whitening mask right away because my skin flushes and gets irritated after being exposed to the sun for too long and whitening products are usually stronger and tends to dry up my skin. So before i apply any whitening products , i will first treat my skin and calm it down first with aloe vera masks or any moisturizing / hydrating cooling masks. Some people have the wrong thinking that they should “salvage” their skin by applying whitening products first. Maybe it works for some people but i find it too harsh for my skin. Hope this post helps to those who ask about masking/sleeping packs. And yup , i put on masks/sleeping packs every night ! You should try to see if there are any improvement in your skin. It doesn’t just happen overnight . It takes sometime depending on your skin type. Whatever works for me may not work for some people. Always ask for sample packs first ( at least for 3 times use ) ! 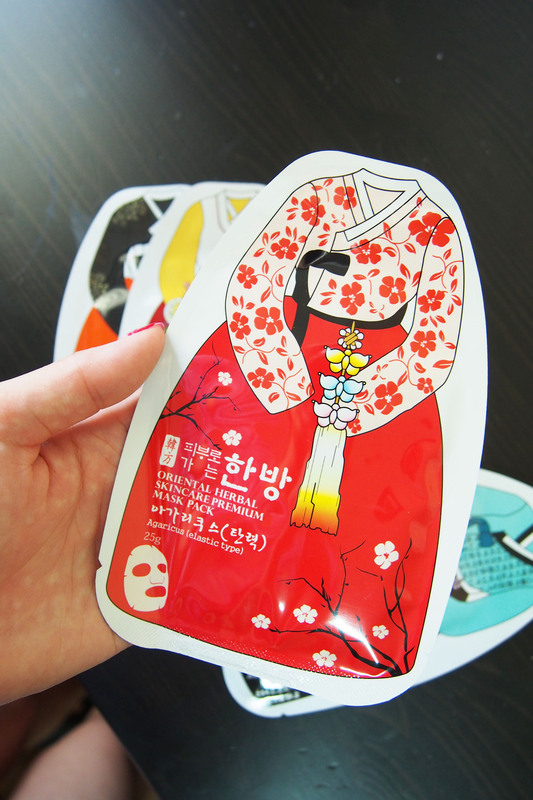 And store your sheet masks in the fridge if you are not using them yet. And here’s a bandage dress coming up soon on Agneselle.com ! I LOVE IT ALOT and im sure you will ! Something that you will always pull it out from your wardrobe and wear ! It is shoulder padded and had a unique side cut. My bf loves it alot and he said very very nice ! This entry was posted in Korean beauty, Laneige and tagged Hera, Korean Aesthetics, Korean MakeUp, Laneige, Sulwhasoo.